​​​ ​AUSTIN – A site that has sat empty for three decades along Barton Springs Rd. is poised to be transformed with 74 upscale apartments that would have pricey rents and views of downtown Austin’s skyline. Located atop a bluff at Barton Springs and Dawson roads, the site once housed a trendy restaurant and club, Mackendrick’s Treehouse, which opened in the late 1970s. 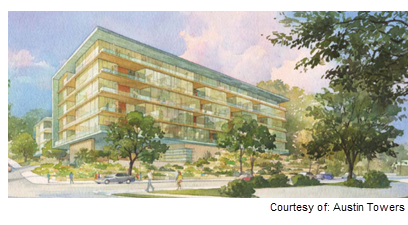 The project, named 1155, plans to break ground in first quarter 2018 after obtaining a building permit from the City of Austin. The development will feature units with an average size of 1,700 sf and estimated rents of more than $5,000 a month, on average, although final numbers have not yet been determined. The project will consist of two buildings—one with six levels and one with four stories—connected by a skybridge. The project is expected to take about 22 months to complete. A filing with the Texas Department of Licensing and Regulation puts the estimated construction cost at $38 million. ​Check ou​t more multifamily stories across Texas.